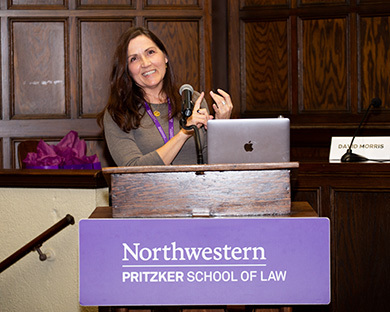 Myra Pasek (JD ’90) opened her keynote address at the 2019 Donald Pritzker Entrepreneurship Law Center (DPELC) Annual Conference by explaining that she doesn’t take her career too seriously. “I’ve always known that both work and school can be really fun,” she said. But those sitting in the audience of Lincoln Hall were ready to take her advice quite seriously. Pasek, the 2019 Distinguished Entrepreneur Award recipient, has had a career that many young lawyers dream of — after years at big law firms, she made the switch into the world of tech startups, working at high-profile companies like Tesla and Impossible Foods. Today, she is General Counsel at Ouster, a San Francisco company bringing 3D sensors to the masses.